We all know what memory is: the recollection of past experiences. Somehow, we are able to register new information, store it and then recall it sometime later. Recollection of facts and events represents a form of conscious, or explicit, memory. We also remember less conscious skills, such as riding a bike, playing a musical instrument or associating simple cues with reward or punishment, which represent more implicit forms of memory. 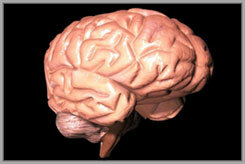 For both of these cases, the process of memory formation appears to proceed through three general stages. Acquisition (learning) involves the initial perception of a new experience. Short-term memory of this newly acquired experience then appears transient and labile. Under appropriate conditions, often requiring repetition and rest, short-term memory of an experience then can be "consolidated" into a more durable long-term memory. The human brain, with 100 billion neurons and 100 trillion connections, is where memories are stored. This remarkable process is accomplished by a unique organ (Figure 1). The human brain is evolutionarily designed to sense its internal and external environment, to perceive causal relations among stimuli and to change its response adaptively. To accomplish this incredible task, a self-regulating network of 40 thousand genes directs the development of a cellular network of one hundred billion neurons with 100 trillion connections among them. Such complexity is staggering. Yet, neurobiologists have begun to understand how the human brain works in part by studying brain function in other animals. New experiences obviously can be quite complex, but when reduced in the laboratory to simple, controllable studies of "associations" between two identified stimuli (Pavlovian learning, for instance), the process of memory formation can be studied in many different animals ranging from insects to mammals. These animal studies have contributed to our current understanding of how memory formation proceeds, revealing aspects of neuroanatomy and biochemistry of the brain. Remarkably, these studies have established that much of the basic biochemistry and behavioral phenomenology of memory formation has been evolutionarily conserved throughout the animal kingdom, even though neuroanatomy differs appreciably among species. These animal studies have shown that memory formation generally proceeds through several functionally distinct temporal phases (Figure 2). Acquisition (LRN) usually requires repetition and is thought to recruit maximal participation of the underlying neural circuitry that normally registers such an experience. Once learning occurs, early memory tends to decay rapidly and is sensitive to disruption by distraction and anesthesia (i.e., anesthesia-sensitive memory; ASM). Genetic dissection of ASM in fruit flies has shown that ASM can be further decomposed into short-term memory (STM) and intermediate-term memory (ITM). By contrast, long-lasting memory becomes resistant to disruption (i.e., anesthesia-resistant memory; ARM) and persists for long periods. Importantly, these animal studies generally have revealed that protein synthesis is required for the appearance of long-term memory (LTM). 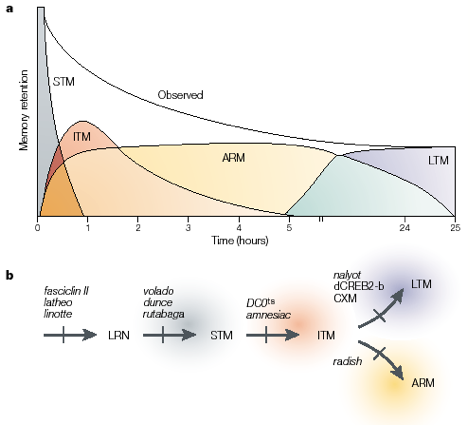 Once again, fruit flies studies have revealed that (i) LTM, but not ARM, requires protein synthesis and (ii) ARM and LTM can be genetically dissected into functionally independent phases of memory. Figure 2. Temporal phases of memory. After a new experience is learned (LRN), memory storage proceeds through several distinct temporal phases (a: STM, ITM, ARM and LTM). Genetic experiments in Drosophila have shown that these phases can be disrupted by mutations in specific genes (b). Analogous memory phases have been shown in several vertebrate species.